The markings must be made before the 60th day after its release as defined in subsection 2(1) of the Customs Act* or before transferring the firearm, whichever occurs first. The purpose of the regulation is to meet the recommendation of the UN Firearms Protocol, a non-binding treaty to which Canada is a signatory. Once Canada has passed a gun marking regulation, it will be able to ratify this treaty. 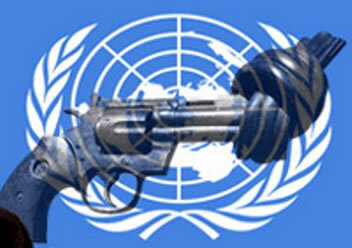 The purpose of the UN Firearms Protocol is to stem the flow of illegal firearms around the world, specifically small arms that are turning up in conflict zones. The protocol provides a number of recommendations that would enable countries to trace the import and export of firearms within their own countries and would enable authorities around the world to trace the source of illegal weapons back to the country legally responsible for them. The Canadian Sporting Arms and Ammunition Association (CSAAA) - which represents legitimate firearms business owners including manufacturers, distributors, wholesales and retailers in Canada – fully supports the fight against illegal arms trafficking both domestically and globally. After all, as legally operating, responsible business owners, our members have a vested interest in identifying and preventing illegal sales which only serve to detract from our revenues as businesses and make us unsafe as citizens. However, the Canadian Firearms Regulation as it is currently written, has several flaws. It has incorporated some of the UN Firearms Protocol recommendations that were written for countries with far less regulation than Canada already has in place. This poorly crafted regulation will result in cost increases to importers that could see the price of individual firearms increase but as much as $200; will cause safety concerns significant enough that some foreign manufacturers will not honor their warranties in Canada; may permanently damage the finish on imported firearms; and cause workplace safety concerns for importers with little or no manufacturing experience. The regulation requires that all firearms imported into Canada bear the name of the “manufacturer” and the firearm’ serial number and be marked with a country code and year of import, or “CA17” within 60 days of the firearm being released from customs or before being transferred beyond the importers. A “manufacturer” in Canadian law is the actual manufacturing facility where the firearm was produced, not the responsible marketing and distributing company. So, for example, a firearm imported into Canada could not be marked by the brand “Browning” it would have to bear the name of the manufacturing plant where it was made. The regulation then requires that the firearm be “stamped or engraved” with the country code and year of import, or “CA17” for example, after being released from customs and before being transferred by the original importer. This means importers, with no manufacturing facilities or experience, will now be in the business of setting up, staffing and operating laser engraving shops. The firearms cannot be transferred to existing engraving facilities to be marked and we have not been able to identify and large engraving facilities in Canada that are willing to go through the onerous and expensive process of becoming firearms licensed. Many of Canada’s small importers will be forced out of business under this new regulation. They will simply not be able to afford the capital investment required to meet the regulation’s requirements. Consumers are likely to see less choice and pay higher prices for firearms in Canada. This will inevitable have a negative impact on smaller retailers which will also be forced out of business. The CSAAA has met with the Minister of Public Safety, the Honourable Ralph Goodale’s, staff to present an effective and reasonable solution to this issue. We have recommended to the Minister’s staff that the regulation be re-worded to require all firearms imported into Canada be marked with the “Make” and the firearm’s unique serial number. We have demonstrated to the Minister’s staff that with the Make and serial number, any firearm anywhere in the world can be traced with one call to the brand company. Using the serial number, the responsible corporate brand can trace a firearm from it’s point of manufacture, through it’s exporter, to its importer and ultimately through the importer to the retailer. With the simple codification of Canada’s current industry practice, Canada can pass a firearms marking regulation that achieves the stated goals of the UN Firearms Protocol with no detrimental affects on the hundreds of small businesses in the sporting arms industry. We presented our solution to the Minister’s policy staff at a meeting on January 23rd, 2017. This position has been supported by some of our largest firearms trading partners. It is our belief that the Minister’s staff is still in the process of considering the final wording of the regulation; but we have had no response to our calls for updates, information or direction. The Minister’s staff have been silent since January 23rd. CSAAA members representing some of Canada’s largest importers have confirmed that they will not move forward on any capital investment in engraving capacity until they receive clear direction from the Government. We continue to press the Minister’s office for information and direction. While we cannot advise individual businesses on a course of action, we can recommend that retailers prepare for a transition period of some kind starting in June by stocking up on inventory. Whatever the outcome, it’s going to be a bumpy ride for the next few months. We encourage business owners to get in touch with your local Member of Parliament, the Minister of Public Safety and the Prime Minister to voice your support for a regulation that requires a “make and serial number” as proposed by the CSAAA. Links to sample letters are included below for your reference. Or email us your message and we’ll forward to the Minister on your behalf, type “Message for the Minister of Public Safety” in the subject box. 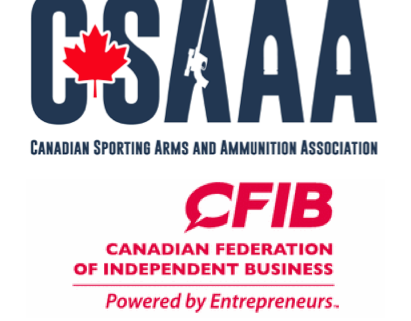 The CSAAA will continue to work with the Government to craft a responsible regulation that effectively combats illegal arms trading while protecting the thousands of Canadian jobs and hundreds of small businesses associated with the legal, responsible sporting arms industry in Canada. The Canadian Sporting Arms and Ammunition Association (CSAAA), representing firearms business owners, has joined with the Canadian Shooting Sports Association (CSSA), representing recreational firearms owners, to empower legal action against the recent decision by the Royal Canadian Mounted Police Firearms Program to prohibit several brands of imported 10/22 enhanced capacity rifle magazines. At this time, due to the controversy, importers, dealers and individual owners are advised to stop sales and transfers of all 10/22 high capacity (over 10 rounds) rifle magazines. Businesses are cautioned not to attempt to “pin” magazines unless their license specifically authorizes work on prohibited magazines. Business owners interested in joining the class action, are asked to email the above information to the CSAAA at csaaa.legalaction@gmail.com For more information call the CSAAA at 705-875-2302. THERE IS NO COST TO DEALERS TO PARTICIPATE IN THIS LEGAL ACTION. However, donations to the CSAAA are welcome. Donations can be made at www.csaaa.org/donate. The U.S. Commercial Service of the U.S. Embassy in Canada is pleased to invite you to join our U.S. Embassy 2017 Buyer Delegation to the SHOT Show, January 17-20, 2017 at the Sands Expo & Convention Center, Las Vegas, NV. We invite you to also pass this invitation along to any of your colleagues that may be interested in attending. Complimentary Registration for the exhibition hall admission (US$70-US$350 savings). Limited complimentary seats for Educational Seminars: Prior to November 3, 2016, delegates may request complimentary seats for Educational Seminars occurring Jan. 17-20. There are limited complimentary seats available that will be provided upon request on a first come, first serve basis. Badge printing in the International Trade Center (ITC) to avoid regular registration lines. Special VIP/IBP recognition badge holder (red fabric holder) so our delegates will be visible to exhibitors. Complimentary Wi-Fi and computer access with printing in the ITC. Breakfast and snacks each official show day in the ITC. Attendance as part of our delegation is RESTRICTED to commercial BUYERS or INFLUENCERS of military, law enforcement, and tactical products and services as well as to buyers or influencers in the shooting, hunting and outdoor trade. The show is NOT open to the public and admission requires government-issued photo ID plus documentation demonstrating direct professional affiliation to the trade. Please submit documentation demonstrating direct, current professional affiliation to the shooting, hunting and outdoor trade, or commercial involvement in the military, law enforcement or tactical markets. Please note that the province will not appear on the registration form, therefore, please disregard State field. Once the form, payment and credentials are received, we will register you on the SHOT Show registration site. If you have already registered to attend the SHOT Show, please let us know if you would like to be registered as part of our delegation. For further information please contact Lucy Latka (Lucy.Latka@trade.gov) or Patrick Barry (Patrick.Barry@trade.gov). We look forward to seeing you at SHOT Show 2017. Canada’s robust firearms import/export regulations already comply with the recommendations of the UN Firearms Protocol – the Criminal Code Firearms Marking Regulation goes too far. On June 1st, 2017 Canada’s Criminal Code Firearms Marking Regulation, passed into law in 2004, will come into force. The Firearms Marking Regulation is the Canadian Government’s interpretation of the recommendations contained in the UN Firearms Protocol, which Canada signed in 2001. The goal of the UN Firearms Protocol is laudable – preventing shipments of small arms from illegally ending up in conflict zones around the world – one which Canada’s sporting arms industry supports. However, it is our position that Canada’s Firearms Marking Regulation is both unnecessary and deeply flawed. The Coming-into-Force of this regulation as written will cause catastrophic damage to thousands of licenced and lawful Canadian small businesses operating in the shooting sports sector. It is the position of the CSAAA that Canada’s Firearms Marking Regulations adds nothing to Canada’s already robust import/export regulation nor would post import marking add anything to ability of domestic or foreign law enforcement authorities to trace firearms entering or leaving the country. All firearms imported into to Canada or exported from Canada can be easily tracked through the import/export process by virtue of their unique serial number. More importantly the Firearms Marking Regulations jeopardize a small business community at a time when our domestic economy is already vulnerable and should be the government’s top priority. The loss of these businesses/employers would mostly affect smaller, rural and northern communities – all of which the government have said are key areas of focus and investment. The CSAAA, along with its industry partner, the CSSA, remain strongly opposed to the implementation of the Firearms Marking Regulations and respectfully request an opportunity to continue discussions of this issue with the office of the Minister of Public Safety at the Minister’s very earliest convenience. 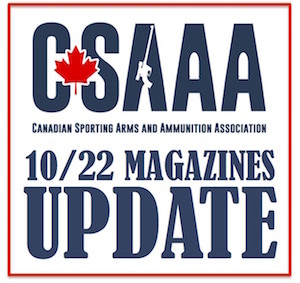 As a result of the current controversy, the CSAAA advises Canadian distributors, wholesalers and dealers with current inventories of any 10/22 high capacity magazines (any magazine not limited to 10 rounds) to cease the trade or transport of these products, now considered prohibited by the R.C.M.P., until further advised. Retailers should remove the product from store shelves and websites and store safely. We do not recommend destroying, returning or "turning in" these products to anyone at this time until further clarification is received. Retailers are advised to tell their customers who currently own any of these magazines not to transfer, trade, or "turn in" these magazines at this time. Nor should they attempt to modify or "pin" the magazines themselves. Consumers should keep the products safely stored in its current location and await further clarification from the national office of the R.C.M.P. Firearms Program. Not all local CFOs or Law Enforcement offices have been informed of this change nor to they have specific instructions on what businesses or consumers are to do. The CSAAA advises businesses to wait for specific, published information from the R.C.M.P. Firearms Program. The following response from the Canadian Firearms Program is being sent out in response to inquiries about the classification of 10/22 magazines. It's clear from the response there has been no new bulletin issued, but rather the R.C.M.P. is stating this is merely an implementation/enforcement of Bulletin No. 72 issued in March, 2011 and modified in September, 2013 . "Magazines designed to contain rimfire cartridges and designed or manufactured for use in a rifle do not have a regulated capacity." "Whether the magazine is intended by the importer to be used in a rifle is not relevant to the classification determination." The Board of Directors of the CSAAA are meeting today to explore action. Please stand by for updates. CSAAA member T&T Arms Inc has become the Canadian distributor for Sightmark, a high quality US optics company, which includes Sightmark, Pulsar and Firefield. 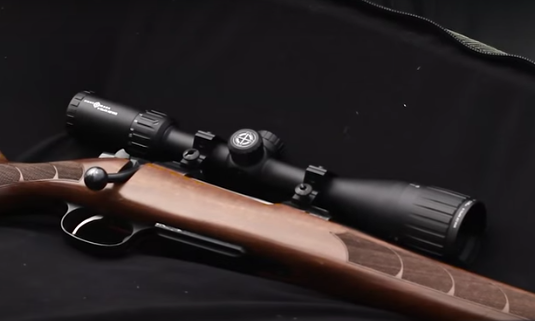 According to Tony Iannella at T&T, these are some of the best quality optics for a very reasonable price with excellent dealer margins, and an incredible value to retail customers. As part of the introduction of these products, there are no minimum order quantities. See links below for current catalogues and sheets including specifications and pricing. 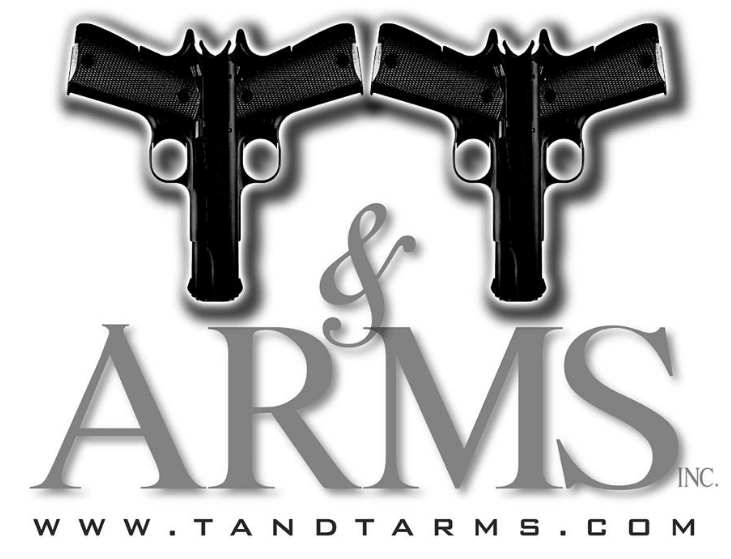 For more information, contact Tony Iannella, Owner Tony@TandTArms.com Tel: 250-498-2033. Hamilton Ward and Cathers Insurance has provided insurance to firearms retailers for over 30 years and we are proud to announce that we have recently partnered and developed in conjunction with Towerhill Insurance Underwriters, a comprehensive package for firearms retailers that offers liability limits from $2,000,000.00 to $10,000,000.00. 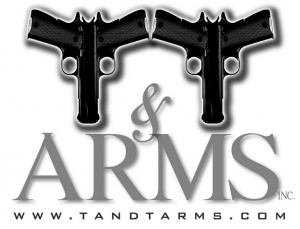 The package includes coverage for firearms, all related accessories and gunsmith operations as well as hunting, fishing and outdoor related equipment and accessories. Additionally, the program provides coverage for shooting and archery ranges (indoor and outdoor) among other features. You’ve invested a lot of time and effort to build your business. Protect everything you’ve worked hard to achieve with business insurance from The Co-operators. For over 65 years, we’ve been helping Canadian businesses just like yours with commercial insurance solutions. With offices located across Canada we are able to service your needs. My own office currently has 4 hunting, fishing, camping/sporting good retail stores as valued clients so we understand your needs. If you are looking for a business solution give us a call at 705-325-2511, ask for Mitchell Shaw.